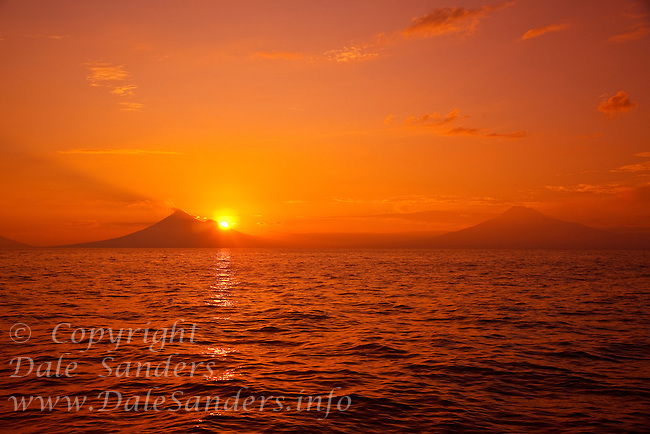 The morning sun rising behind a couple of distant volcano's... as seen from a dive site in the Fathers Reefs off New Britain Island, Papua New Guinea. A small tendril of steam rising from the 2,334 meter high summit of Mount Ulawan is a gentle reminder that we are diving in Papua New Guinea’s “Ring of Fire”. Papua New Guinea has over sixty volcanoes strewn across its vast archipelago… nineteen exist on New Britain Island alone… and five of those are currently active.